The Iranian authorities have started to block the BBC's Persian language internet site, for the first time. The BBC says the level of traffic to the site from within Iran has dropped sharply over the last three days. No official explanation has been given. The BBC has expressed concern at the action, saying it deprives many Iranians of a trusted source of news. The BBC said it would be approaching the Iranian government at an official level about re-instating access. 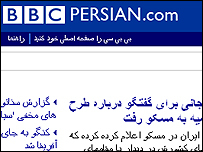 BBC Persian.com is the most popular of the BBC's non-English language websites, receiving about 30 million page impressions a month - about half of which are from inside Iran. BBC World Service radio broadcasts in English and Persian are being received by audiences in Iran as normal, as are the BBC's international online news services in English. When entering the BBC's Persian site a sign comes up saying "access to this site denied", says the BBC's Frances Harrison in Tehran. It is not clear if the filtering will be permanent, but many websites are routinely blocked in Iran, our correspondent says. The BBC says readers from Iran have begun emailing them to ask for help with what are known as filter-buster sites, which enable access to banned sites.